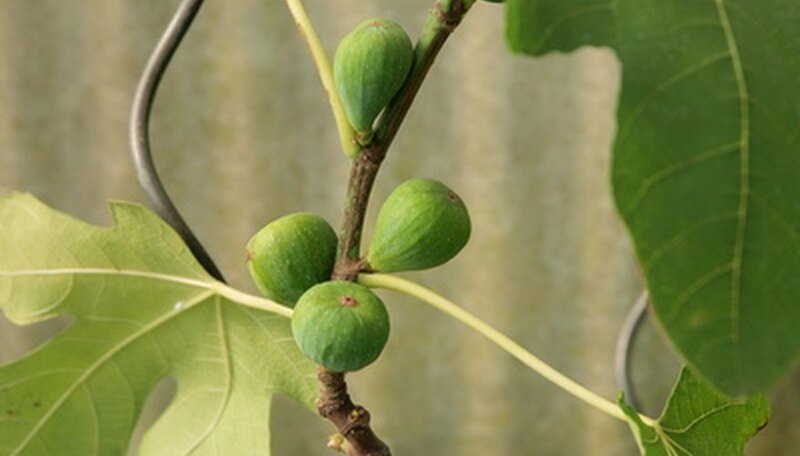 Although more than 800 species belong to the Ficus genus, referred to as the fig group, most individuals will encounter only a handful of these species. 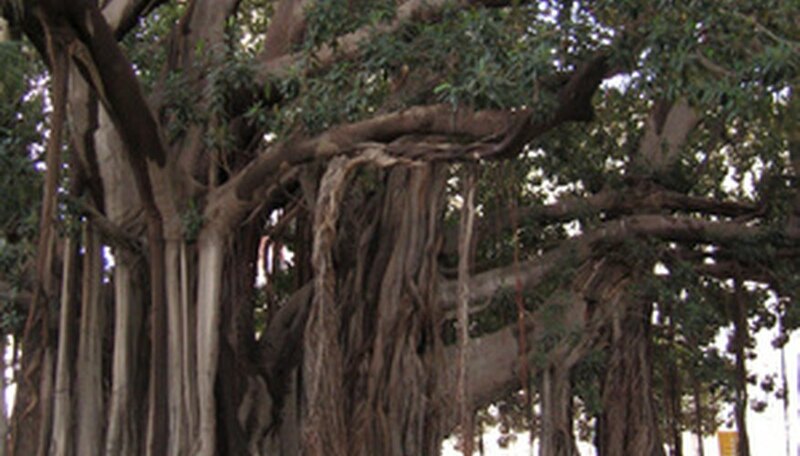 Some Ficus species are trees, some are vines and others are shrubs. Ficus trees are popular houseplants prized for their attractive foliage. The Ficus species are also the most popular bonsai trees, because nearly all Ficus trees withstand hard pruning and can be reduced or shaped to smaller sizes. Spot the common fig tree (Ficus carica) by looking for its edible fig fruits and extremely large, bright-green, lobed leaves. The common fig is one of the few deciduous Ficus trees and has smooth gray bark. Identify the weeping fig tree (F. benjamina) by its weeping form, its smooth, gray bark and oval, large, leathery leaves, which are usually bright green but can be grayish-green or yellowish depending on the cultivated variety. The weeping fig is the most popular indoor Ficus tree and includes such cultivars as Florida Spire, Golden Princess, Golden King, Jacqueline, Spearmint and Wintergreen. Look for leaves that are the same size as the weeping fig but that grow on stiffer branches instead of weeping ones to identify the Ficus retusa "Nitida." Another cultivar, F. retusa "Green Gem," resembles Nitida but has coarser leaves and tends to grow more symmetrically. Spot the rubber tree (F. elastica) by looking for aerial roots that form multiple trunks, as well as its large, coarse, deep-green and burgundy leaves. 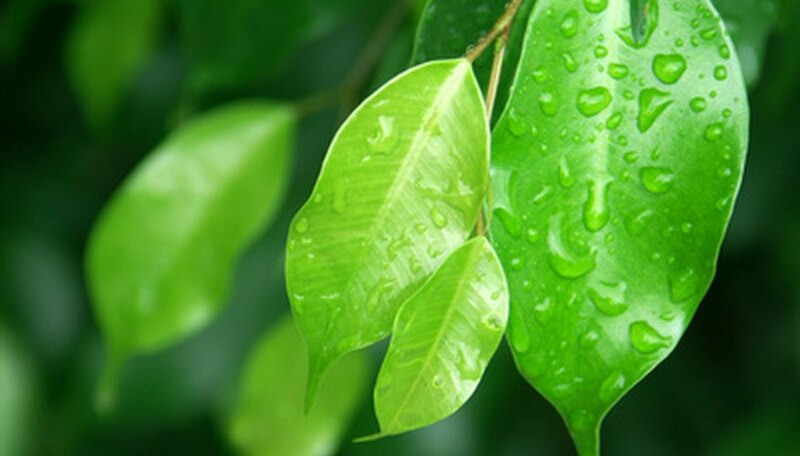 The rubber tree grows up to 40 to 50 feet tall, and when you cut into the leaves or stems, the rubber tree oozes a sticky white sap. Identify the narrow leaf or willow leaf fig (F. salicifolia) by its small, narrow leaves and aerial root formations in humid environments. Look for large, closely-spaced leaves to identify the fiddleleaf fig (F. lyrata). Look for a Ficus tree with small reddish-orange flowers and glossy, dark-green leaves to identify the Moreton Bay fig (F. macrophylla). The leaves often have a leathery texture and the tree sprouts aerial roots in higher humidity. Spot the Alii fig (F. maclellandi) by studying its leaves. The Alii fig has long, narrow leaves that are willow-like in their size and shape. Identify the Port Jackson fig (F. rubiginosa) by its glossy, dark-green leaves that are oval in shape. 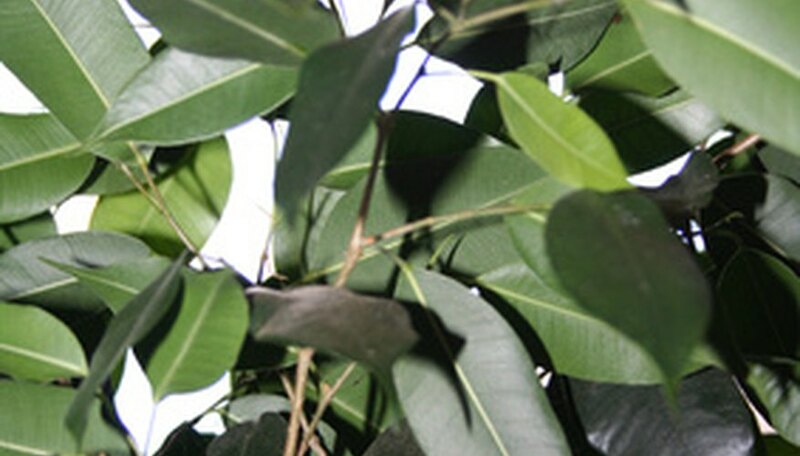 This Ficus species has rust-like down coating the undersides of the leaves. Look for 4-inch-long, leathery thick leaves with the classic oval shape and glossy, dark-green appearance to spot the Chinese banyan (F. retusa var. microcarpa). 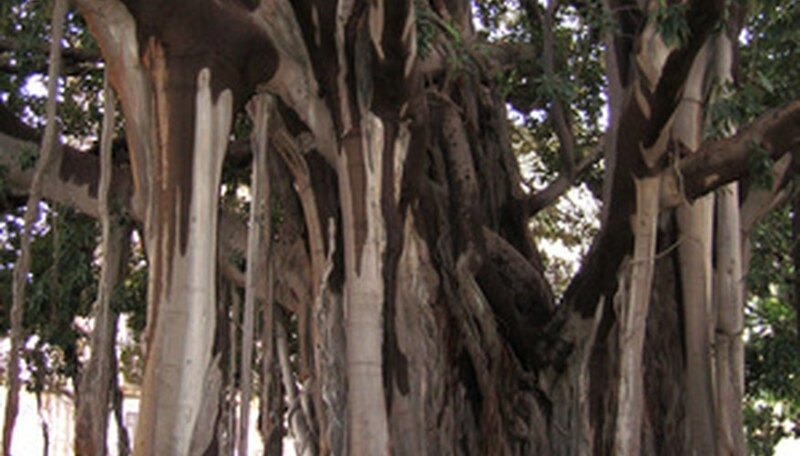 This Ficus tree has banyan-like roots. Spot the strangler fig (F. aurea) by its large size, growing up to 50 feet tall with aerial roots that develop around trees and encase them. Native to South Florida, the strangler fig is vine-like and feeds off its host tree, eventually killing the host. Another common Ficus species is the creeping fig (F. pumila), which has oval or heart-shaped, dark-green leaves and is a climbing vine-like plant. As the creeping fig matures, it develops dense foliage of leathery, lighter-green, oblong leaves that are 2- to 4-inches long. The narrow leaf or willow leaf fig, weeping fig, Chinese banyan, Moreton Bay fig and Port Jackson fig trees, as well as several F. retusa cultivars, are all popular for bonsai cultivation. Don't confuse the many F. retusa cultivars, nearly all of which grow large, multiple, banyan-like roots. You can identify the Ficus retusa 'Hawaii' by its variegated leaves that are green, grayish-green and ivory.